This entry was posted in Metaphysics on March 31, 2016 by Grandtrines. The early hours are tough for most people who are up at that time, but they can also bring inspirations to writers and other communicators. Harness the window if you can; it is fleeting. Moon turns void at 11:39 AM CDT and remains void for most of the reset of the day (until Moon enters 8:37 PM CDT). Today is “April Fools Day” for those who celebrate such thing, so watch out for Uranian / Plutonian “holiday” surprises. We note five (5!) Mercury aspects, and noting that Mercury rules tricksters, jesters, thieves, and liars, do be extra careful regarding these kinds of surprises. But, again, writers and communicators will likely thrive today. Today is an unusually strong window for writers and communicators (maybe the strongest this year). 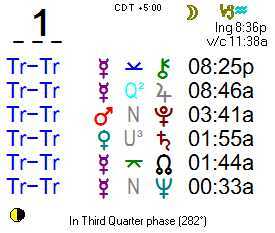 Moon conjunct Pluto at mid Capricorn (tropical zodiac). Moon Capricorn @ 12 deg. Sun Aries @ 11 deg. Mercury Aries @ 19 deg. Venus Pisces @ 23 deg. Mars Sagittarius @ 07 deg. Uranus Aries @ 19 deg. Only a little over four weeks until the next one. Better get ready! This entry was posted in Astrology, Metaphysics and tagged Astrology, Mercury, mercury retrograde on March 31, 2016 by Grandtrines.